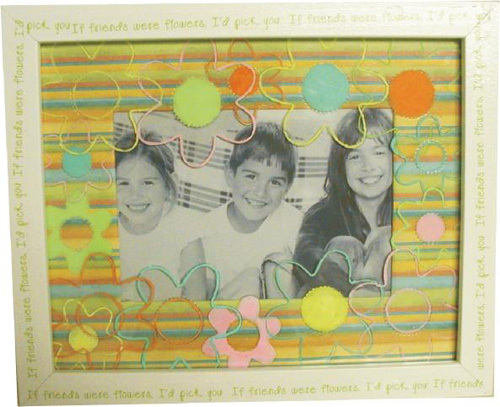 Project Description: Make your own custom picture frame for any event! Remove the matte from the photo frame. To cover the matte with patterned paper, lay striped paper face down and place the matte in the center. Trim around the matte leaving a 1” border. Cut an “x” in the hole in the center of the matte from corner to corner. Carefully fold the paper back and secure with tape. Continue to wrap the matte in patterned paper and secure each side with tape. Die Cut several daisies out of the Craft Plastic Sheets. Peel off the protective liner and decorate the daisies with Souffle Pens. Layer the daisies on the glass inside of the frame. Place matte over the daisies and then insert a photo. Replace the back of the frame. Create a sentiment for the frame on your computer. Print on to the Rub Onz film and apply to the edges of the frame according to the instructions on the package.